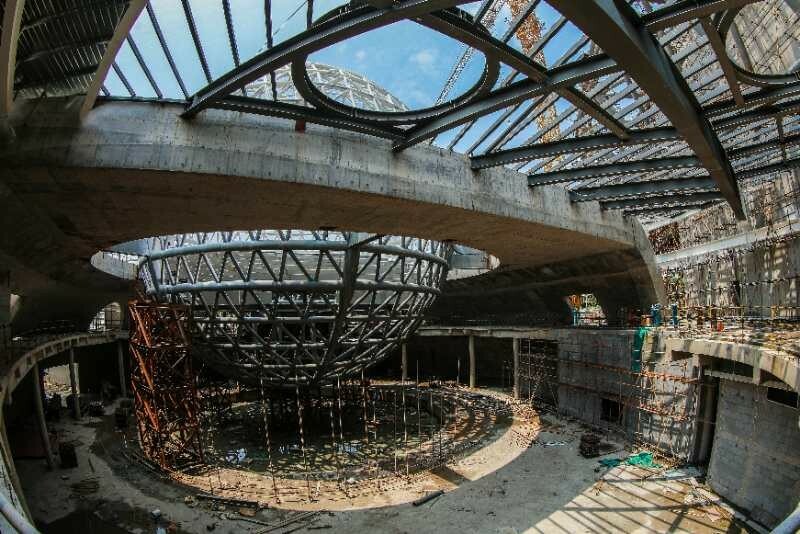 On June 12, 2018, Shanghai Planetarium (a branch of Shanghai Science and Technology Museum) unloaded its large cantilever structure as a whole, marking the successful completion of all the main steel structure projects at the museum and completion staged success of the main structure construction. The structure of Shanghai Planetarium is extremely complex, especially the "big brim hat of the main building", i.e. the large cantilever structure which is rarely seen. It consists of a two-story two-way truss structure with a span of about 61 meters and a horizontal cantilever distance of about 36 meters. Over 2,000 tons of steel has been used. It is by far the largest cantilever structure in China, and poses the greatest challenges. At the construction site, you can see that the future Shanghai Planetarium starts with an arc, with a series of spiral ribbon-like orbits surrounding the whole building. In the main building, three circular structures constitute a "three-body" structure, and the elliptical shape symbolizes the orbit of celestial bodies, which together with the "three-body" structure interprets the basic law of celestial body movement. The main building also features many unique designs such as the dormant window with round holes, the inverted dome, and the spherical curtain halo, so that the building is similar to an astronomical instrument in appearance. In the landscape area outside the main building, there are four non-concentric walkways extending outward to symbolize the spiral arm of the galaxy. Shanghai Planetarium covers a floor area of 38,164 square meters, and will become the largest planetarium in the world after completion.